Willie Stargell was one of the most beloved players of the 1970s, by both teammates and fans alike. He became "Pops," the home-run-hitting spiritual leader of one of the most admired World Series-winning teams ever, the 1979 Pittsburgh Pirates. His team dedication also made his baseball cards incredibly popular and this top list brings together his best appearances from his playing days and beyond. Shop for Professionally Graded Willie Stargell Cards on eBay. 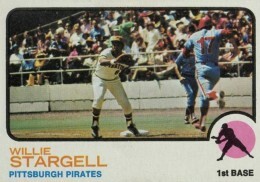 Stargell spent 21 seasons with the Pirates and over that time he led them to six division titles and World Series championships in 1971 and 1979, both over the Baltimore Orioles. He smacked 475 career home runs and probably would have been credited with a hundred more if he hadn't played in the unfriendly-to-hitters Forbes Field for much of his early career. His role in leading the "We Are Family" Pirates to the World Series titles in 1979 forever bookended his wonderful career and made him a lock for the Hall of Fame. That year he became the first player to win his league's MVP award, the Championship Series MVP, and the World Series MVP all in the same season. Collectors interested in some great Willie Stargell cards beyond this list can take a look at the statistical leaders cards from 1971 Topps and 1974 Topps which feature him on combo cards with Hank Aaron and Reggie Jackson, respectively. Additionally, Donruss produced several memorable Stargell cards, including a card in 1981 Donruss honoring "Stargell Stars" which were Pirate team patches worn on the cap and given out by Willie to players who made a great play. Stargell was featured as a Diamond King in the 1983 Donruss set and in the 1991 set, to coincide with his induction to the Hall of Fame, Stargell was the subject of the Diamond King puzzle. 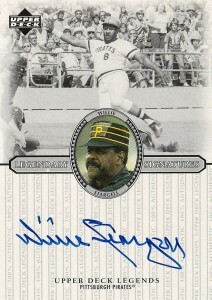 Two recent sets have notable Stargell base cards as well. In 2014 Topps Archives you can find a Stargell card in the 1989 Topps design and in 2015 Topps Stadium Club his card shows him celebrating the 1979 World Series title. Based on his long and storied career, Willie Stargell has many in-demand cards with incredible values. In creating this list, card value was balanced with the desire to build a comprehensive collection covering Stargell's remarkable career. Some of my personal favorite cards from the 1960s Topps sets are the duo cards that often combine two great players together. 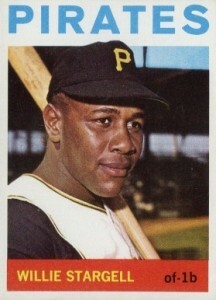 Stargell was featured on two of these duo cards with teammate Donn Clendenon who was the Pirates first baseman for most of the 1960s. 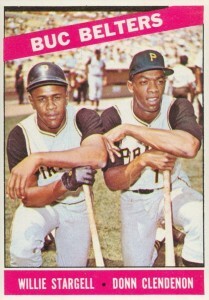 This "Bucs Belters" can be found in the 1966 Topps set and you can find a similar card titled "Pitt Power" in 1967 Topps as well. 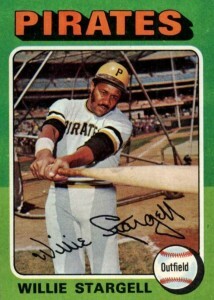 Willie Stargell began his career as a left fielder but moved to first base permanently beginning in the 1975 season. His 1976 Topps card features him with his first baseman mitt and a very serious look on his face. 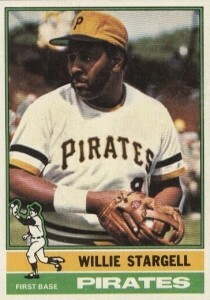 While most of the base cards in the 1975 Topps set feature two contrasting colors in the design, Stargell's card (along with several other Pirates) has just two slightly different shades of green in the design that you might not even notice at first. On his card, Willie swings directly at the camera demonstrating how wide his reach was with the bat (more about that at card #4 on the list). Topps really stepped up their in-game photography in the 1973 set offering several horizontal action shots of many great players. Here Stargell waits for the throw at first to try to get Philadelphia Phillies second baseman Terry Harmon out. The crowd behind them is almost as interesting as the action as you wonder if the person to the left of Willie is really wearing yellow cowboy boots to a baseball game. Although he was called "Willie" by fans, teammates, and just about everyone else, Stargell's first name was Wilver and he often signed as such on baseballs and cards. You'll also find that signature on many of his Topps cards including his 1967 Topps appearance. 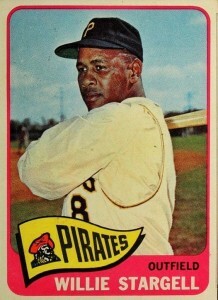 The 1965 Topps Willie Stargell card highlights the odd jerseys the Pirates wore in the early 1960s. Instead of having a jersey in one single piece, the middle section was like a vest and players were able to wear longer-sleeved undershirts of white or black underneath. While most teams typically had the city name on the front of their away jerseys, Pittsburgh only used "Pirates" on both their away and home uniforms. 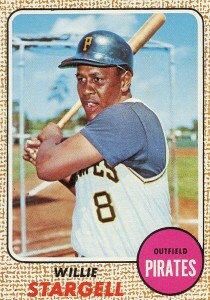 Stargell's swing on his 1968 Topps card demonstrates his unique style of holding the baseball bat. He would place his lower hand on the bat completely on the knob with his upper-hand immediately above it. This allowed him to extend the bat's reach beyond what it would be with a typical swing technique. Willie Stargell passed away in 2001 and so his pool of certified autographs is limited but collectors do have some great examples to choose from. 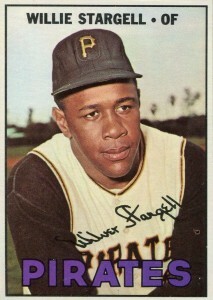 Featuring a distinct look, Stargell batted and threw left handed and his memorable autograph is highly slanted to the left. Upper Deck's Legends set from 2000 offers a nice on-card autograph. While his first Topps card (see #1 on the list) fetches prices at auction that are far above what many collectors can afford, his second-year card from 1964 Topps offers an early Stargell appearance at a much more budget-friendly price point. Willie is a fresh-faced outfielder here making his first All-Star team during the 1964 season. 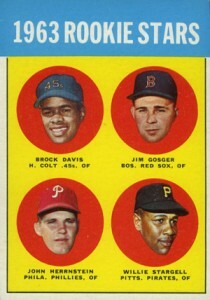 After Pete Rose's famous rookie from the 1963 Topps set, Stargell's rookie card, which he shares with Brock Davis, Jim Gosger, and John Herrnstein, is the most sought-after rookie from that year. Even though none of the other three players had much success in the majors, highly-graded copies of this card can reach nearly $1,000 at auction. 1971 Topps Willie Stargell PSA 8 Beauty!